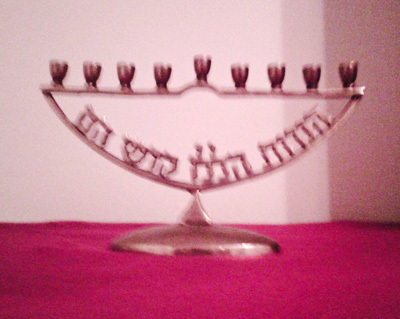 My parents collect menorahs – I amass them. The difference is that they actively seek theirs, while I passively receive mine. For some reason, I seem to receive a lot of them. I suppose once you have a critical mass of any item, people assume you collect it – and suddenly, you do. 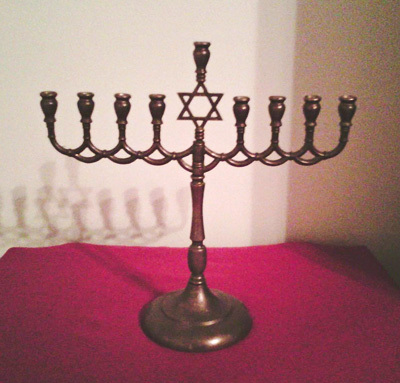 The first menorah that I could really claim as mine was a traditional bronze one. It was given to me for my bar mitzvah by my mom’s old boss at an interior design firm. When I was cleaning it one year, I thought I broke it, until I realized that it unscrews. The base, stem, and branches all detach. This makes it easy to pack when I move, I suppose, though it’s not all that huge to begin with. I also have one of the “Tree of Life” menorahs. Well, we do, since it was a wedding present for my wife and me. In cleaning the wax off, some of the silver plating came off, which is a shame. 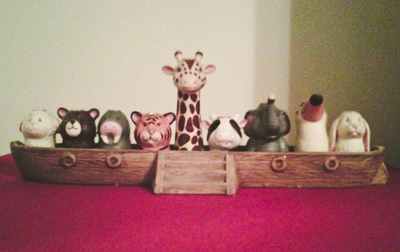 My older son, Noah, received a Noah’s Ark-shaped menorah as a gift from my co-workers when he was born. The giraffe is the shamash, which is clever, but the toucan is larger than the other animals, even the elephant, which is confusing. I mean, they are not to scale altogether, but if they are made to be all the same size, then what’s so special about the toucan? 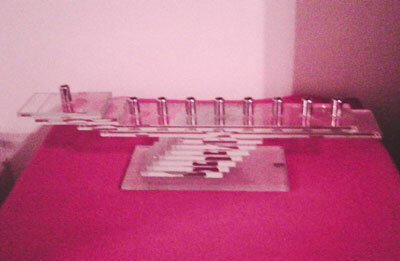 I have displayed the menorah but never used it. I am afraid to scrape wax off of ceramic, or put something so fragile in the sink to run hot water over it. My grandmother gave me one when she moved. She, too, has amassed many menorahs over the years. When she moved from her house of 30-some years into a one-bedroom apartment, the grandkids each got to pick something, so I took this menorah. It has a line from the “HaNeirot HaLalu” prayer in it. 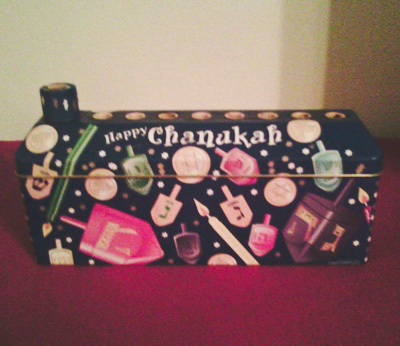 The line simply means, “these candles are holy.” I had a friend over for Chanukah once, and let him light it. He said he was honored to light my grandmother’s menorah. I had never thought of it that way, but I guess he’s right. My wife’s favorite, however, is a painted metal one that I think looks like it’s for kids. It’s hollow, so it can hold a whole box of candles. The top comes off like a lid. I have to say I have no idea where it comes from or who gave it to us. But it’s very colorful and fun, and I can see why she likes it. 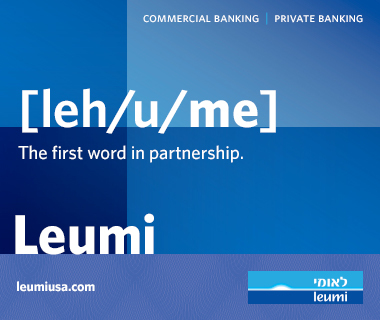 After all, Chanukah is a fun holiday. 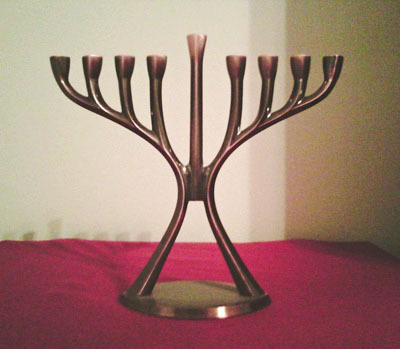 This menorah makes a nice contrast with all the more formal ones, too. There are two others that my wife has amassed— again, they came to her. I guess my menorah magnetism has rubbed off on her too. One is very traditional; if someone asked you to “draw a menorah,” you’d draw this one. The other is an Art Deco take on the usual shape. We do end up using most of these menorahs on Chanukah. My wife and I each light one, each of the three kids lights his or her own, and my in-laws also light one when they are over. So we need at least six, and I usually go through two whole boxes of candles every year. 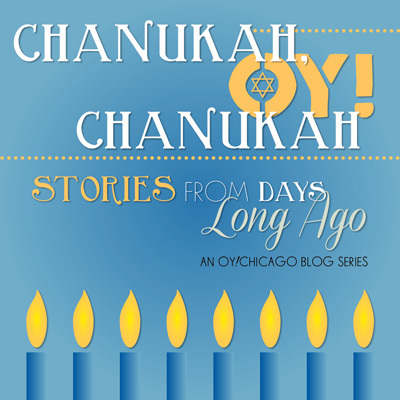 After all, six menorahs times nine candles each (don’t forget the shamash!) can mean 36 candles on the eighth night alone, and a standard box holds “only” 44. When I look at the veritable fireplace my dining room table has become at Chanukah in recent years, I think back to when I was single a decade ago — lighting just my own menorah. 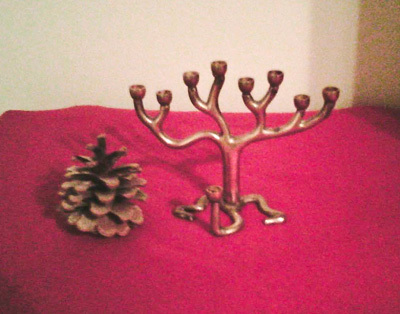 Since then, I have amassed much more than a shelf-full of menorahs.